Sometimes after we have a dream, it's not always obvious what the dream might be about or what symbols might be important. In this post, we'll share a simple dream analysis technique called the Colored Pencil Method. I started using this technique in dream interpretation for my own dreams when I was about 12 years old. It's very easy to do - but don't be fooled by its simplicity! You can gain some very powerful insight when you do this simple activity. 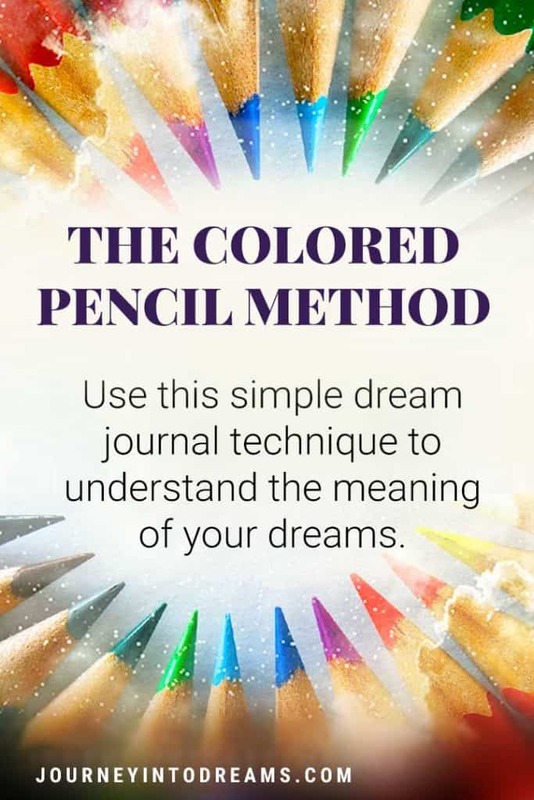 The colored pencil method is a very easy way to analyze what your dreams mean. This technique helps you identify key symbols in a dream and how they might all relate to one another. What Supplies Do I Need to Do This Method? You don't necessarily need any special supplies - and truth be told I typically use colored pens more often than colored pencils when I use this technique in my own dream work for myself or when reading dreams for others. For this activity, you will need either a blank sheet of paper, or you can work out of your dream journal. And, as you may have guessed - You will also need some colored pens or colored pencils. My favorite colored pens are Pilot G2 Gel Pens because they last forever, but of course you can use any type that may be available to you. Why Do We Use Colored Pens or Pencils? Using color for the dream interpretation helps provide some contrast and sort of gives you a way to easily identify the different types of elements in the dream. This is also why I call this "The Colored Pencil Method". Maybe not the most creative name for the technique, but it is easy to remember! I have found through years of experience, it is very helpful to have different symbols and themes marked by various colors when you go back to read a dream later. This is especially true when the details of the original dream may be long gone from your memory. After you write down your dreams in a dream journal, you simply go back and go through the dream with 3-4 different colored pens or pencils to underline, circle, or otherwise highlight key symbols that might stand out. Once you do this, it simply becomes a matter of piecing them all together. And of course, colors often have their own meanings in dreams! This is a super simple method with just 4 easy steps. Once you learn these basics, you will be able to easily begin identifying what your dreams may mean. Step 1: Write down the dream with as much detail as possible. The more details you can provide, the easier it will be to associate possible meanings of words you use to describe the dream. After the dream is written down, you will then go through and highlight various key elements with a colored pen or pencil. We recommend using three different colors for each type of element: Verbs/Action words, Feeling/Adjective/Descriptive Words, and Noun/Objects words. After you have highlighted the key elements of the dream, the next step is to write free associations related to each dream element. In a way, you will be creating your own dream dictionary specific for your own interpretation of dream symbols. Dream: Running into a vase, causing it to break. Someone is angry at you. Once you have identified and described the key elements of the dream, you next step is to think how they relate to waking life. In this example, based on the words we've highlighted, the dream might mean you have been rushing not paying attention to delicate matters. The dream might also suggest subconsciously you feel guilty and are facing consequences. Of course, it all depends on you and your own individual life situation. There's no "wrong" or "right" answer - it just depends what you, as the dreamer, might experience. Remember: You are the best interpreter of your dreams and you are the best person to decide what something might mean! Have you used this method before for interpreting your dreams? Do you enjoy this process in your dream journals? Share your experiences in the comments section below! « What is Lucid Dreaming?